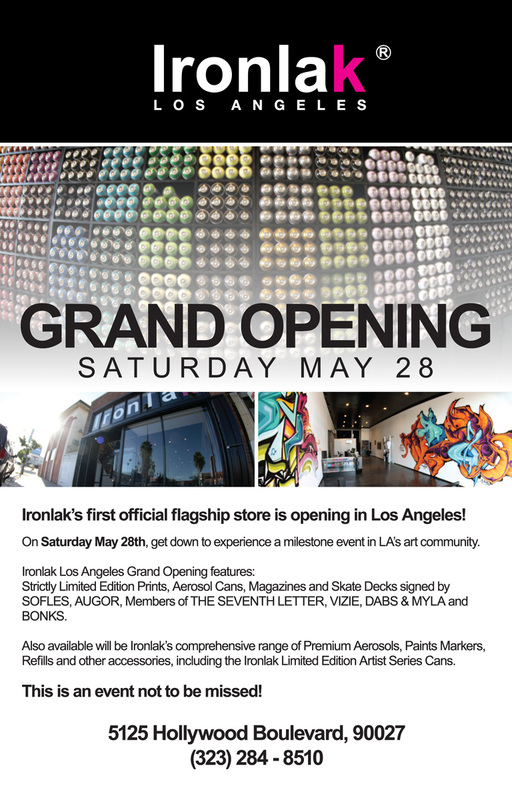 Ironlak proudly presents the MAY 28th, GRAND OPENING of our premier flagship store in Los Angeles, California from 7-11PM. Located at 5125 Hollywood Blvd, just west of Normandie at the edge of Thai Town.We’ll have a bunch of Ironlak giveaways and drinks, Live performances from DJs RO BLVD, ROCKWELL (of The 87 Stick Up Kids), LADYMONIX and Los Angeles Wordsmith THURZ (of U-N-I). Come check out the new works, pieces and plethora of fresh prints. 400ml cans on sale for $4.50 a pop and 10% off literature, sketchbooks and apparel all night! You will not want to miss this event, so Come out and get it in with us!!!! Carrying all colors of Ironlaks supreme quality 400ml aerosols, 600ml Reloads, 500ml Tar paint, 100ml lil’ laks, 15 and 3mm paint markers, 250ml marker refills, team apparel, caps and tech drawing pens. Limited Edition Artist Series cans from EWOK, MEKS, MR. WANY, VANS and SIRUM. LE cans, magazines, limited edition prints and skate decks signed by AUGOR and THE SEVENTH LETTER. Limited Edition giclee and screen prints from Ironlak team and extended family members SOFLES, DOES, AUGOR, VIZIE and DABS & MYLA. We also carry a wide selection of KRINK, JUNOBO, OTR, WITCHES BREW, PILOT, SAKURA, PENTEL, and UNI markers and inks. Brand new Apparel and accessories by Ironlak LA, GRAND SCHEME and SEVENTH LETTER. Comments Off on IronLAk this Saturday!